Thank you for your interest in employing RichmondCC students and alumni. RichmondCC's Career and Transfer Center wants to help you connect with qualified job candidates, whether you have full-time positions, part-time job openings, internship opportunities, sponsorships, or apprenticeship programs. Post positions to our online job board at collegecentral.com/richmondcc. 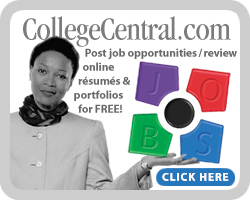 College Central Network is our online job board for RichmondCC students, alumni, and community members. Individuals can search by major, location, degree, and other options. If you hire a student or alumni, please share the information by emailing pjstanley@richmondcc.edu or log in to your College Central Network account and select the "Report an Offer/Hire" option. Internships give students the opportunity to gain valuable applied experience and make connections in professional fields they are considering for career paths, and give employers the opportunity to guide and evaluate talent. To learn more, download the Employer Guide to Organizing a Successful Internship Program. To get started, complete the Internship Proposal Form. If you have any questions, contact Patsy Stanley, Director of Career and Transfer Center at (910) 410-1830 or pjstanley@richmondcc.edu. If you would like to visit our campus to hire students, register on College Central Network (our online job board) and post your open positions. Once your positions are posted, contact Patsy Stanley, Director of Career and Transfer Center at (910) 410-1830 or pjstanley@richmondcc.edu to schedule a recruiting visit. If you would like to hold a job fair on our campus or at your facility, contact Patsy Stanley, Director of Career and Transfer Center at (910) 410-1830 or pjstanley@richmondcc.edu to schedule. Power the World Career Fair - March 12th, 11 am - 2 pm, Registration is FREE. Contact Lori at (910) 410-1722 or ldmclaughlin@richmondcc.edu. CLICK HERE FOR DETAILS!